It is now confirmed, the Swatch Skiers Cup, the international freeskiing’s yearly intercontinental showdown, will take place on February 21-27 2015 in Zermatt, Switzerland. 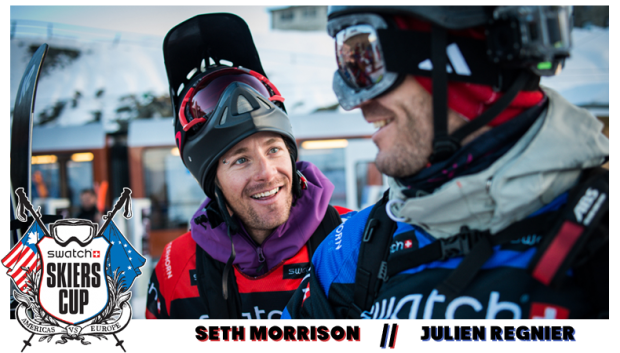 Julien Regnier (FRA) returns as captain of Team Europe and Seth Morrison (USA) leading Team Americas. The fifth edition of the Swatch Skiers Cup will be marked by the loss of one of skiings most remarkable and truly inspirational human beings, JP Auclair (CAN), former captain of Team Americas who won the competition last winter. JP was a pioneer for putting the “free” back into freestyle and freeskiing. He passed away in an avalanche accident late September together with fellow freeskier Andreas Fransson, in Patagonia. In honor of his person and role in creating a whole new era of skiing at the entrance to this millennium, this edition of the Skiers Cup will be dedicated in memoriam of JP Auclair. In this unique freeskiing event, seven of the best riders from each region are selected by a team captain. In a face off in match play format during two days of competition, the teams will compete in both Big Mountain (freeride) and Backcountry Slopestyle (freestyle). Once again, Zermatt will be hosting the event, guaranteeing outstanding terrain in a spectacular setting in front of the almighty Matterhorn. The Backcountry Slopestyle competition and special entertainment in the village are all accessible to the public which adds to the very special atmosphere of this event. Julien Regnier will return to his role as captain for Team Europe. With an international career that started in 1998 when he qualified for the French Olympic Team in mogul skiing at the age of 18, Julien has ever since continued to evolve in the skiing world. He is considered a visionary rebel, a trendsetter and a strong asset in the evolution of freeskiing and ski equipment. It will be exciting what teams the two captains can manage to bring together to settle the current even score of 2-2 after the first four editions. The full teams for the fifth edition of the Swatch Skiers Cup will be announced in the beginning of December.